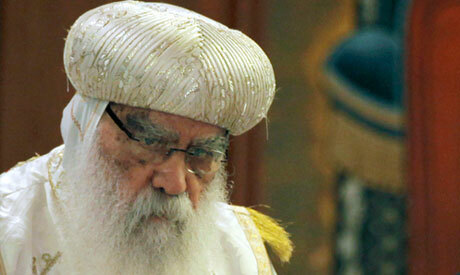 The Coptic Church's acting-pope Bishop Pachomios announced the official withdrawal of all of Egypt's church representatives from the Constituent Assembly on Saturday, Egyptian state-run news agency MENA reported. "The ongoing process within the Constituent Assembly will not guarantee a constitution that will provide national consensus or that reflects the identity of Egypt," Bishop Pachomios said reading the joint statement, which added that the church's stance is in line with the majority of Egypt's national forces who have voiced their disapproval of the proposed constitution. However, the acting pope did not specify which particular points within the draft charter the church disagreed with. On Thursday, representatives of all of Egypt's churches, including the Coptic, Catholic and Evangelical denominations, met and agreed to withdraw from the Islamist-led assembly in protest of a number of articles revealed in the latest draft national charter. The beleaguered assembly has already suffered a number of withdrawals since 11 June, when the 'Egyptian Bloc' parties – including the Free Egyptians, the Egyptian Social Democratic Party and the leftist Tagammu Party – initiated a walk-out, followed by the Karama Party, the Socialist Popular Alliance Party and the Democratic Front Party, to allow greater representation for women, young people and Coptic Christians, while also registering their objection to "Islamist monopolisation" of the assembly. Meanwhile, the assembly is still facing the risk of dissolution by court order due to a case challenging the constitutionality of the law which set the criteria for choosing its members. The 100 assembly members were chosen by the now-dissolved parliament, which was ruled unconstitutional by the High Constitutional Court (HCC) in mid-June. On 23 October, the Supreme Administrative Court referred the lawsuit challenging the assembly's constitutionality to the HCC, which is yet to issue its verdict. It has been claimed that some assembly members are attempting to draft the constitution quickly and submit it for a national referendum before the court issues its verdict. The first assembly was dissolved in April after a court ruling stated it was not representative of Egyptian society. The same criticism is being directed at the current constitution-drafting body. All Egypt history of more than 5000 years show that Egypt was always a secular Society to Guarantee Free of speech, Equal Justice and Equal opportunity in the pursuit of Happiness. Theocratic,ie. Religious State- Judaism , Christianity and Islam- never allowed free speech nor any of the two equalities. Therefore, Egypt's Modern Constiyution mjust be Secular and disregard any Religion . As Religion is a relationship between Man and his God as they believe in. Religious rules must not be imposed and all who do not believe the power religion. All Religions are exclusive...BUT a national Constitution must be free of any religious connotation.